Evie Hone was born in Dublin in 1894 and studied at the Byam Shaw School of Art in London and also at Westminster School of Art where she became acquainted with Mainie Jellett. She and Jellett studied under Andre Lhote and Albert Gleizes in Paris, returning home in 1923 and bringing ideas of Modernism and Cubism with them to Ireland. Hone is most famous for her work in Stained Glass and her works in Cubist painting have been almost overlooked which is unfortunate as she is one of the leading figures of the modern movement in Ireland and is one of the founding members of the Irish Exhibition of Living Art. Only a few of Hone’s Cubist paintings exist but it is clear from these remaining works that she worked with more spontaneity and fluidity than Mainie Jellett. Choosing not to put obvious titles upon her paintings she allowed the viewer to place their own meanings onto these abstract compositions. 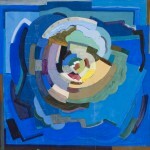 Hone used her experience as a Cubist painter to inform her pursuits in Stained Glass resulting in a unique stained glass style. The rest of her career became dominated by her stained glass works gaining notable acclaim for windows such as: My Four Fields Green, 1939, Government Buildings, Ofiice of the Taoiseach, Dublin and the East Window for the Chapel at Eton College, Windsor. This entry was posted in Artist Profile and tagged abstract, Cubism, Influences of Modernist Abstraction, Irish Exhibition of Living Art, Modernism. Bookmark the permalink.